Use the Contractor Termination of Employment Agreement when accepting the resignation of a contractor. This agreement can be used with a reminder of the contractor's nondisclosure and non-distribution agreements and reminds the contractor of their tax responsibilities. The contractor termination agreement also reminds the contractor that they are responsible for final payments to their vendors, employees, and subagents. This Contractor Employment Resignation is included in editable Word format that can be customized in Word or by using the included Wizard software. Company Name ("Company") and First Last ("Contractor") hereby agree to this Resignation Agreement, effective Current Date. As a reminder, the Company's non-disclosure and non-distribution agreements are excerpted below. 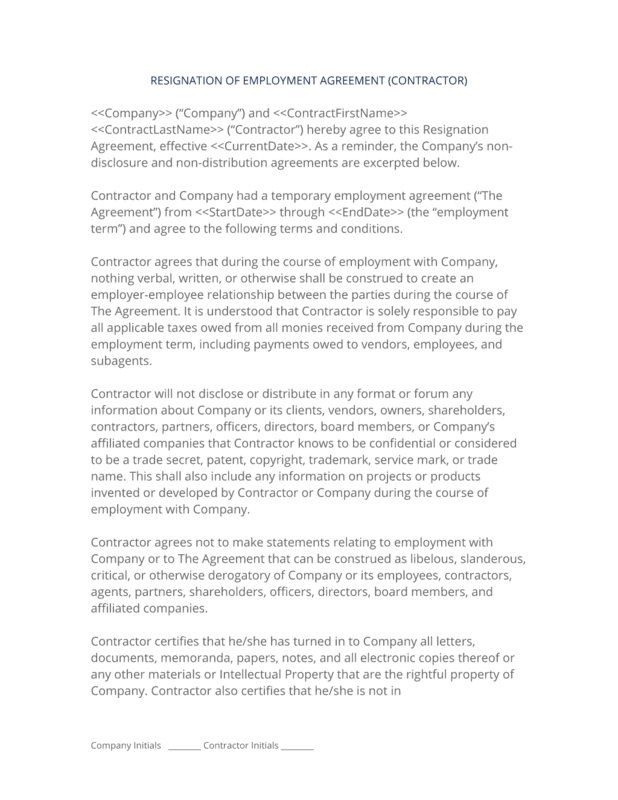 Contractor and Company had a temporary employment agreement ("The Agreement") from Start Date through End Date (the "employment term") and agree to the following terms and conditions. Contractor agrees that during the course of employment with Company, nothing verbal, written, or otherwise shall be construed to create an employer-employee relationship between the parties during the course of The Agreement. It is understood that Contractor is solely responsible to pay all applicable taxes owed from all monies received from Company during the employment term, including payments owed to vendors, employees, and subagents. Contractor will not disclose or distribute in any format or forum any information about Company or its clients, vendors, owners, shareholders, contractors, partners, officers, directors, board members, or Company's affiliated companies that Contractor knows to be confidential or considered to be a trade secret, patent, copyright, trademark, service mark, or trade name. This shall also include any information on projects or products invented or developed by Contractor or Company during the course of employment with Company. Contractor agrees not to make statements relating to employment with Company or to The Agreement that can be construed as libelous, slanderous, critical, or otherwise derogatory of Company or its employees, contractors, agents, partners, shareholders, officers, directors, board members, and affiliated companies. Contractor certifies that he/she has turned in to Company all letters, documents, memoranda, papers, notes, and all electronic copies thereof or any other materials or Intellectual Property that are the rightful property of Company. Contractor also certifies that he/she is not in possession of any other tangible Company property, including but not limited to: keys or physical access devices, products, equipment, media, any Company source code, object code, telephones, charge cards, vehicles, or any other tangible property. Contractors who have access to Company computers, servers, accounts, subscriptions, or other Company property shall not access those resources for any reason without explicit permission from Company. Company will pay Contractor any outstanding hours owed from an approved timesheet, including any funds owed to Contractor from approved expense reports. All outstanding funds owed Contractor shall be mailed to Contractor in the form of a check mailed to Contractor's on-file physical address. Contractor is responsible to give Company any updates to his or her address in order to receive 1099 tax document(s) for the next tax year. Company and Contractor further agree that in the event of any breach or threatened breach of this Resignation Agreement or default hereunder; the injured party has the right to pursue any legal action available to enjoin the breaching party from further injurious conduct and/or to recover damages from the breaching party for their conduct. The complete Contractor Employment Resignation - with the actual formatting and layout - is available in this Contract Pack.